The choice of Team Honda for years on all there in-line 4-cylinder race bikes in Superbike, World Championship Endurance and Formula One classes. 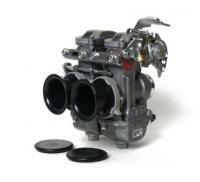 You'll find the power you need with these Keihin Roundslide CR carburetors. Designed for use on sidedraft four-stroke motorcycle engines. Features include: Improved throttle response; direct linkage to slides provides more precise control than vacuum slide carburetors. Smooth venturi design produces stronger power than original equipment carburetors using butterfly throttle valves; A 10% horsepower gain can be expected. Available for petrol or methanol use. (Rejetting required when using methanol) Ready jetted, these kits come complete with mounting spigots, velocity stacks and stack covers.